Make plans to attend the Hot Shops Gallery the afternoon of March 3rdfor the opening of Shatterproof. Billed as “an extraordinary Fine Art event,” the show features the work of veteran artists Les Bruning and John Miller. 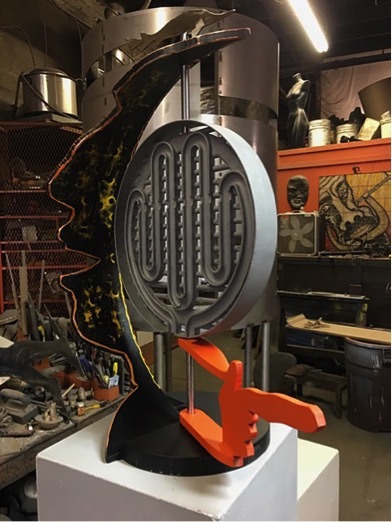 Sculptor Les Bruning, a founding member and partner in the Hot Shops Art Center, will feature recent works from his “Vector Series” and “Street Conversations” series. Bruning’s work is known for simplified, graphic forms and conservative use of primary and secondary colors. He frequently incorporates perforated metals for their transparent qualities, combining them with stainless steel, machined aluminum and symbolic, cut or formed metal shapes. Contrasts between organic and architectural elements are common in much of his work. Some of the work uses industrial materials combined with mechanical movement and lighting. A former department head and professor of art at Bellevue University, his work is included in many public and private collections. He was a founding member of the former Omaha Creative Institute, now Amplify Arts, and is an advocate, participant and organizer for many public art projects. Joining Les Bruning is artist John Miller. A founding member of the (original) 13thStreet Gallery, Miller has also been active in the Omaha art scene for close to forty years. He has helped organized several exhibits at the former Antiquarium Book Store gallery, and most recently was co-curator for the 65+ exhibit at Gallery 1516. 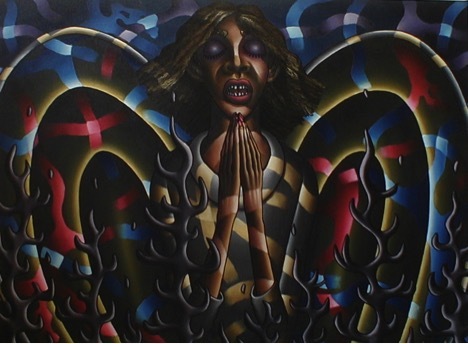 Miller has taught at Metropolitan Community College and Joslyn Art Museum, and continues to offer private painting instruction through his studio in the Hot Shops. He is a past recipient of the Individual Artist Fellowship from The Nebraska Arts Council, and was awarded an Omaha Entertainment Award in 2006. His paintings are held in numerous private collections. Miller’s recognizable style, sometimes darkly narrative, sometimes humorous, reflects the 60’s and 70’s poster art- and underground comic-stylings of R. Crumb or Peter Max, and occasionally incorporates borders of text that enhance the anecdotal aspects of the scene. Shatterproof opens March 3rdwith an afternoon reception for the artists, from 2-5PM. The Nicholas Street Gallery is located in the Hot Shops, 1301 Nicholas Street. The show runs through March 28th. Contact hotshopsartcenter.com for further information.